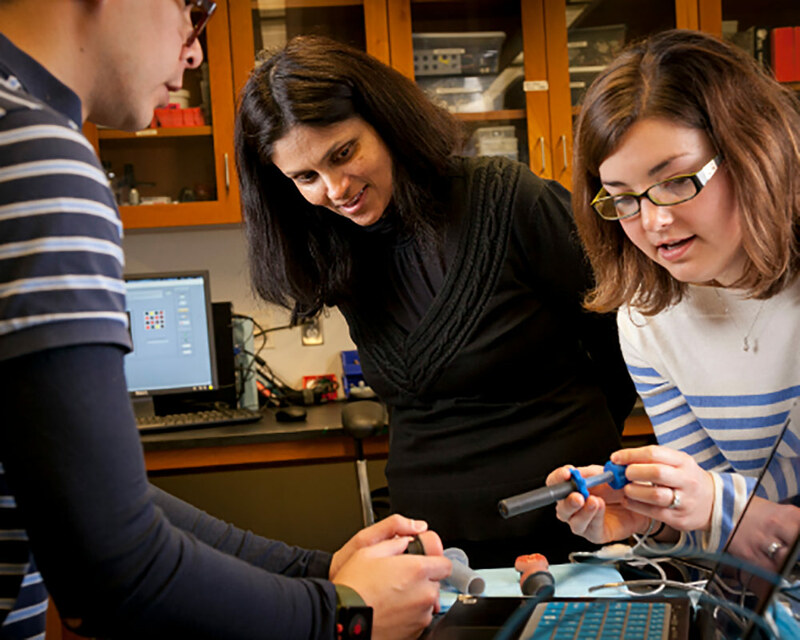 To say I was full of trepidation when offered the chance to speak with Dr. Nimmi Ramanujam, Professor of Biomedical Engineering and Director of the Center for Global Women’s Health Technologies at Duke University, would be a massive understatement. How do you speak to a woman who is quite literally changing the way we, as an entire world, will screen for cervical cancer? But the woman on the other end of the phone couldn’t have been more personable. She put me at ease and admitted that she too was feeling apprehensive about our interview. In awe of this woman who is both unabashedly brilliant and willing to be vulnerable, I continued with the thought-provoking, personal questions I like to pose to lady guns and offered space for her to express the technical (as well as creative) side of her work in biomedical research. Though the number of new cases and deaths from cervical cancer has decreased over the last 40 years, the American Cancer Society still estimates nearly 13 thousand women will be diagnosed with new cases of invasive cervical cancer and approximately 4200 will die from it this year in the United States alone. If there is a purpose to be found in this life, hers is a truly altruistic one -- though she would disagree with you. “When someone asks me if I’m being altruistic, I say no. There has to be self-interest for people to want to do these things. For me the self-interest is creating communities that are diverse, that go beyond our niche, and alter the status quo.” That still seems pretty benevolent to me. Nimmi has built a team that is reimagining reproductive technology, that seems so dated, and redesigning for where we are in our world today. They have created a prototype of a device, called the pocket colposcope, which eliminates the need for a speculum and is opening the doors to self-screening for cervical cancer. The pocket colposcope will make it more accessible to screen for cervical cancer in lower income areas in our country and others around the world. Testing has begun, but there is still much to do. ON LOOKING BACK AT HISTORY TO REDESIGN FOR OUR WORLD TODAY: I like history and I look back at why things were done the way they were. We are, as a society, people who build off of previous contributions, previous innovations, and previous discoveries. But what we don’t realize is those previous advances were made in different environments that are not like ours today. An invention that was made at the time of slavery might have a different set of design criteria than one that is made today. One great example that has really transformed the way I think is the speculum. It was developed as a surgical instrument and later on was further developed [to be used] on slaves. It became something that made its inventor a historical figure, but none of the slaves ever gave permission and were completely dehumanized for the sake of medicine. Moreover, it was designed by a man who viewed a woman’s reproductive anatomy as disgusting and filthy. I asked myself if we were to redo these things, how would we do it today? And that’s what inspired the pocket colposcope. WHY THE POCKET COLPOSCOPE IS IMPORTANT: It has to do with health disparity. We think about systems that are in place that assume people can seek out care when they need it. But often when you’re in a society where a woman is the caretaker of the household, has very little voice in terms of what decisions are to be made, and in some cases not even allowed to leave her home to venture out, you really have to think of new models of care. I grew up in a society like that, where women’s voices were just very meek for the most part. I thought ‘why is it that care is always for people who can make it to places?’ Here, we’re very empowered -- we’re always able to get in our car and go places. Why do we have these different levels of care? The greatest impact is to have technology bring preventative care to the population level. That’s where you can have the greatest impact. You make it easier for people to follow through and get the care that they need. That’s the vision for the pocket colposcope. In fact, while trying to disseminate the pocket colposcope itself we’ve realized there are other bottlenecks in the system that have created multiple programs as a result, focusing [on] low-resource settings. Our vision is to get these technologies to mobilize healthcare in a way that creates more access from the outset and prevents the need for what I would call ‘advanced care.’ In many low-resource settings, advanced care is often inaccessible because women can’t get to it or nonexistent because the infrastructure isn’t there. ON HER NEXT STEPS: We’ve done testing in four countries on 500 women and our goal there was to validate the device, against pathology and standard of care colposcopy. [There are] three main things [that make up] our next steps. First, we have to get it out there through health providers -- actually bring it to population health where we can compare it to what it’s like when you don’t have the device. We also want to ask the question, ‘what’s the benefit of bringing secondary level care (which is what colposcopy is currently in low-resource settings) to the primary care setting?’ If we are able to empower communities with the ability to perform screening and diagnosis (and possibly, treatment) in an accessible location, we could help to eliminate an additional touch point for the woman, reduce the risk to follow up, and provide the appropriate follow up right where she is. [The second] piece is advocacy. [We need to] focus on the women and how we can empower them. We can have health providers all day long trying to do colposcopy or screening, but if the women don’t show up or don’t know that it’s important, then we haven’t really solved the problem. We’re doing an art campaign where we’re going to essentially do a photo-elicitation project which asks women what it is like for them to see their own cervix. This could be a tool for education about reproductive anatomy for women who are traditionally not well-versed in that, [for example] international settings. The third piece is education. One of the big questions right now is figuring out the commercialization strategy and also how to empower providers to use it. How do we build a platform to engage students and have them be a part of bringing the technology to the ultimate stakeholders? The curriculum at Duke and the programming at the Center for Women’s Health Technologies gives students ownership of some aspect of the research and overall process that [will] ultimately impact a woman somewhere in the world who doesn’t have access to screening. And that’s the way we want students to think about it, that they are incredibly important in this process and without them we simply cannot do it. It’s real life, not a classroom project and that, in itself, is empowering. ON THE CHALLENGES OF PEOPLE: [In my work day] people are the most challenging. Trying to figure out new ways to create tribes, become part of a new tribe or bring someone in to be a part of our tribe. That’s how I see the world: we’re all communities. And communities try to have an identity and do things that matter, or don’t matter in some instances. When we want to have an impact on communities, which is what we’re striving to do, that brings challenges. And people are a part of that challenge. ON HER WOMEN-CENTRIC TEAM: I don’t try to do that (surround herself with a team of women). I believe strongly in parity. I think we need to live in a world where people work together, rather than being isolated or siloed by any identity. But at the same time, the work that we do obviously has a relevance to women. So I think there’s a natural tendency for women who work in engineering or for that matter not in engineering to say ‘how can I use this area that I’m working in or how can I engage in this area to make a difference for the stakeholders that will benefit from it?’ It’s natural, it’s organic, and it’s not forced. I believe that you should always hire the best person for the job, specifically someone who is passionate about making a difference. ON WORKING WITH WOMEN: While I don’t discriminate or preferentially select [based on] gender, I like encouraging women to make women’s health better and focusing on women’s advocacy. I’m all for things related to making women more empowered and [making] things for women more equitable in the world. When we create programs, we think about how are we impacting women, even indirectly, through their health or their providers and how we are increasing the pipeline of women into this environment so they can be the next generation of leaders to carry the torch forward. We’re making the environments conducive to women to persist, but we’re also engaging those constituents to reach out to either have an impact on women’s health through their research or to educate the next generation of leaders and bring them in, thereby increasing the diversity pipeline. Our students are integral actors within the creation and implementation of campaigns, communication of health equity ideas and positive impact on women at-large. ON BUILDING HERSELF UP AFTER SELF-DOUBT AND ADVERSITY: I have to first grieve because I think to not acknowledge what has happened is not good. I just got four grants rejected last week and I haven’t had grants rejected in a really long time. I had to sit there and mope for a very long time and then I realized that I would have to pull myself up. I always have a bigger holistic plan, [asking] ‘who do I want to impact?’ and the [thing] that brings me back is the big picture. When I pull myself back up, I say ‘what does this mean in the scheme of things -- does it mean that I didn’t do the job well or does it mean that I can’t control the world around me?’ And most of the time, if you work hard, there are two potential outcomes, that you really did miss something or that you did not miss anything at all. In the first scenario, you must realize that every time you get rejected you close one door and open another and that door has got really amazing opportunities that you have yet to realize. In other words: it’s a teachable moment. In the second scenario, you need to realize that not everyone is going to feel the same way that you do or your peers do about your work. You need to assure yourself that you gave your best effort and that you need to find those other avenues to reward that effort. ON BEING LONG-SIGHTED: The biggest thing that helps me is identifying what’s important to me and having the self-awareness that there is no right answer. The only thing you can do is look at things on a long-term basis, and you’ll see these little blips are very little. It’s important to be long-sighted and not short-sighted, because I think [being] short-sighted means you’re reactive and long-sighted means you see obstacles as just a blip in the ocean. If you falter, then those long-term goals cannot be fulfilled. It’s a disservice really -- it’s being selfish. ON CREATING COMMUNITY: I sometimes don’t feel that I’m a part of any real community here in the United States because I’m from another country. The Center that I have created gives me a sense of belonging to a community of kindred spirits. This was something that I needed to do for myself in order to better integrate other people like myself who have a shared vision. ON SACRIFICE: I originally thought that I was sacrificing my family sphere, but I don’t feel that way anymore because I have two daughters. To me, sacrifice means that I’m giving up something that I care about. And if you know your priorities, then you’re not sacrificing, you’re prioritizing. I find that word very tricky, because I think sacrificing means I’m not doing what I want to do. When I start to say the word sacrifice, then I’ll have to reevaluate doing what I am doing. You have to ask yourself what really matters to you and if all of the aspects of your life integrate, then the balance is created naturally. ON INSPIRATION: My love of music is undeniable and I’ve played music all my life. I’m learning a new instrument to rekindle my interest in music. Music is my greatest source of inspiration in that it forces me to constantly be exposed to something new and different. It forces me to grow, to have tension and discomfort, and it also makes me think of something very fundamental to me: communities. I always think of music as the anchor that brings people together. And I always ask the question, ‘why doesn’t science and engineering do that?’ How do you make engineering something like music that builds a sense of community? I want the work that we do at the Center to be pervasive, to be personal and to be something that people can relate to and understand. ON SCRUTINY AND SELF-WORTH: The biggest thing that I’ve accomplished is having a sense of self-worth. It’s a very hard thing for me to always feel like the cup is half empty, because in our field we’re scrutinized -- not that you’re not scrutinized in everything else in life, but [engineering] is about being critical, it’s about being right, it’s about being exact. And I’m realizing that through that process I lost a lot of my sense of self-worth, when that was what got me to the level where I was respected. It is ironic, it is a paradox. That process of constantly drilling and putting myself in a place of scrutiny made me finally evolve to a point where I now feel like when something gets rejected, or something doesn’t work, or there’s a problem, I tell myself it’s not about me. It’s about the process, it’s about something specific, and I am above that. That was an important revelation for me: that every failure or every success doesn’t define me. That was one of the major barriers for me for many years. It’s like imposter syndrome: when something good happens it was somebody else, but when something bad happens it was all me. It’s tragic. ON SUCCESS, SELF-PROMOTION AND IMPACT: [Success] is about people. If you’d asked me this six months ago I probably would have said I don’t know, because I could never quite identify with accolades. People always say you have to go out there and share your successes, but it’s very hard and it’s something that I don’t do enough of. This idea of self-promotion is an interesting one. I always thought, ‘gosh, why would anybody do that?’ That’s how people define success -- by your awards, by your funding, by your papers -- and some of it is done too by social media. Now I see it differently, I think self-promotion is very important, not for the reasons of success, but to have an impact. So for me success is about who I can impact. I can impact myself, my family, my students, a broader group of learners, women’s health, health providers’ view of women’s health, the community at-large. It comes down to people. When we leave, when we look back on our lives, it’s about how we touched the lives of others. I do think as a Center we have big aspirations and we want every single thing we do to have impact and that, in turn, will be viewed as success because of the fulfillment that comes from it. ON CREATING YOUR VILLAGE: The key [when it comes to tackling challenges] is being able to quickly identify what I don’t know and seeking out people who have done it before or who have had some experience. Or even [finding] people who were the wrong people, because they said things that made me think ‘oh that’s not the way to do it!’ because of the visceral reaction when something is not right. If you have an emotional narrative, people really [invest] in it and they become part of your village, the next thing you know you’re solving it together and the challenge isn’t yours, the challenge is yours and others’, which makes it so much easier to deal with than if you’re a singular person trying to deal with [it]. What I am most proud of is building a team. That team is diverse. The team has an identity -- they all want to solve the same problem and they come in with very different perspectives and from very different disciplines. The key to addressing challenges is to be able to identify people who are going to work with you in the face of adversity and help you move forward on a unified vision. WHAT SHE WANTS YOU TO KNOW ABOUT ENGINEERING: We need to see engineering much like a paint brush -- I credit this idea to Ravi Bellamkonda, Pratt School of Engineering at Duke University. Think of engineers as artists with a paintbrush and canvas, rather than geeks with circuits and resistors. There are basic ingredients, you have to know the skills, but beyond that what you create is yours. There’s a lot of creativity that goes into the process of coming up with solutions that impact human health. Engineering itself is just a means to an end -- it’s not cold, hard and boring. It can be really engaging and fun if you have the right vision and passion for what you want to create with it.